The maximum frequency deviation of the carrier is usually specified and regulated by the licensing authorities in each country. For a stereo broadcast, the maximum permitted carrier deviation is invariably ±75 kHz, although a little higher is permitted in the United States when SCA systems are used. For a monophonic broadcast, again the most common permitted maximum deviation is ±75 kHz. However, some countries specify a lower value for monophonic broadcasts, such as ±50 kHz. The first FM subcarrier transmissions emanating from Major Armstrong's experimental station KE2XCC at Alpine, New Jersey occurred in 1948. These transmissions consisted of two-channel audio programs, binaural audio programs and a fax program. The original subcarrier frequency used at KE2XCC was 27.5 kHz. The IF bandwidth was ±5 kHz, as the only goal at the time was to relay AM radio-quality audio. This transmission system notably used a 75 µs audio pre-emphasis, a technical innovation that became part of the original FM Stereo Multiplex Standard. The (L+R) Main channel signal is transmitted as baseband audio limited to the range of 30 Hz to 15 kHz. The (L−R) signal is amplitude modulated onto a 38 kHz double-sideband suppressed-carrier (DSB-SC) signal occupying the baseband range of 23 to 53 kHz. A 19 kHz±2 Hz pilot tone, at exactly half the 38 kHz sub-carrier frequency and with a precise phase relationship to it, as defined by the formula below, is also generated. This is transmitted at 8–10% of overall modulation level and used by the receiver to identify a stereo transmission and to regenerate the 38 kHz sub-carrier with the correct phase. The final multiplex signal from the stereo generator contains the Main Channel (L+R), the pilot tone, and the sub-channel (L−R). This composite signal, along with any other sub-carriers, modulates the FM transmitter. Another way to look at the resulting signal is that it alternates between left and right at 38 kHz, with the phase determined by the 19 kHz pilot signal. Most stereo encoders use this switching technique to generate the 38 kHz subcarrier, but practical encoder designs need to incorporate circuitry to deal with the switching harmonics. Converting the multiplex signal back into left and right audio signals is performed by a decoder, built into stereo receivers. Again, the decoder can use a switching technique to recover the left and right channels. VHF Radio waves do not travel far beyond the visual horizon, so reception distances for FM stations are usually limited to 30–40 miles (50–65 km) They can also be blocked by hills or buildings. The knife edge effect can permit reception where there is no direct line of sight between broadcaster and receiver. The reception can vary considerably depending on the position. One example is the Učka mountain range, which makes constant reception of Italian signals from Veneto and Marche possible in a good portion of Rijeka, Croatia, despite the distance being over 200 km. Other radio propagation effects such as tropospheric ducting and Sporadic E can occasionally allow distant stations to be intermittently received, but cannot be relied on for commercial broadcast purposes. FM broadcasting began in the late 1930s, when it was initiated by a handful of early pioneer stations including W8HK, Buffalo, New York (now WTSS); W1XOJ/WGTR and W1XTG/WSRS, both transmitting from Paxton, Massachusetts (now listed as Worcester, Massachusetts); W1XSL/W1XPW/WDRC-FM, Meriden, Connecticut (now WHCN); W2XMN/KE2XCC/WFMN, Alpine, New Jersey (owned by Edwin Armstrong himself, closed down upon Armstrong's death in 1954); W2XQR/WQXQ/WQXR-FM, New York; W47NV Nashville, Tennessee (signed off in 1951); W1XER/W39B/WMNE, whose studios were in Boston but whose transmitter was atop the highest mountain in the northeast United States, Mount Washington, New Hampshire (shut down in 1948); W9XAO Milwaukee, Wisconsin (later WTMJ-FM, off air in 1950, returning in 1959 on another frequency). Also of note are General Electric stations W2XDA Schenectady and W2XOY New Scotland, New York—two experimental frequency modulation transmitters on 48.5 MHz—which signed on in 1939. The two were merged into one station using the W2XOY call letters on November 20, 1940, with the station taking the WGFM call letters a few years later, and moving to 99.5 MHz when the FM band was relocated to the 88–108 MHz portion of the radio spectrum. General Electric sold the station in the 1980s, and today the station is called WRVE. Like Australia, New Zealand adopted the FM format relatively late. As was the case with privately owned AM radio in the late 1960s, it took a spate of 'pirate' broadcasters to persuade a control-oriented, technology-averse government to allow FM to be introduced after at least five years of consumer campaigning starting in the mid-1970s, particularly in Auckland. An experimental FM station, FM 90.7, was broadcast in Whakatane in early 1982. Later that year, Victoria University of Wellington's Radio Active began full-time FM transmissions. Commercial FM licences were finally approved in 1983, with Auckland-based 91FM and 89FM being the first to take up the offer.. Broadcasting was deregulated in 1989. Low-power transmitters such as those mentioned above are also sometimes used for neighborhood or campus radio stations, though campus radio stations are often run over carrier current. This is generally considered a form of microbroadcasting. As a general rule,[vague] enforcement towards low-power FM stations is stricter than with AM stations, due to problems such as the capture effect, and as a result, FM microbroadcasters generally do not reach as far as their AM competitors. ^ "Transmission standards for FM sound broadcasting at VHF". ITU Rec. BS.450. International Telecommunications Union. pp. 4–5. ^ "FM BROADCAST STATION SELF - INSPECTION CHECKLIST" (PDF). transition.fcc.gov. FCC. p. 18. Retrieved 8 June 2018. ^ "UK Ofcom Engineering Code" (PDF). ^ RWO. "How FM Stereo Came to Life". ^ Théberge, Paul; Devine, Kyle; Everrett, Tom (2015-01-29). Living Stereo: Histories and Cultures of Multichannel Sound. Bloomsbury Publishing USA. p. 189. ISBN 9781623566876. ^ van Duyne, John P. (Fall 1961). "The Notebook:A Modulator for the New FM Stereo System". Boontown Radio Corp. CiteSeerX 10.1.1.309.3861. ^ "73-319" (PDF). www.govinfo.gov. FCC. Retrieved 22 January 2019. ^ "Subsidiary communications multiplex operation: engineering standards" (PDF). www.fcc.gov. US Federal Communications Commission. Retrieved 12 January 2017. ^ "FM Stereo demodulation circuit". USPTO. Retrieved 6 December 2015. 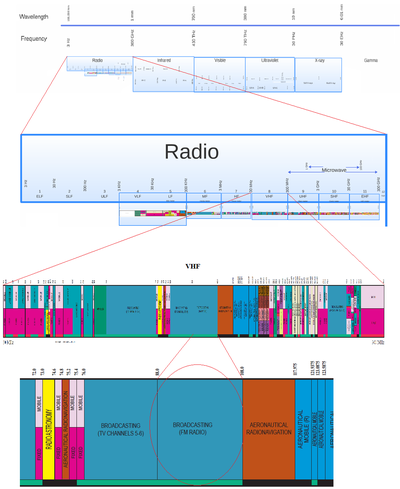 ^ "FM Reception Guide: FM Propagation". WGBH. Archived from the original on 8 July 2007. Retrieved 9 May 2010. ^ "SSBSC: A Win-Win for FM Radio?". ^ "Compatible four channel FM system". pdfpiw.uspto.gov. USPTO. Retrieved 19 October 2016. ^ "Full text of "Radio Electronics (August 1987)"". archive.org. ^ "CRIS Radio - The Chicago Lighthouse". ^ no byline (January 1, 1954). "MUSIC FOR BUSES URGED / F. C. C. Proposes Wide Field Also for FM News Reports". The New York Times. Retrieved February 19, 2019. ^ "Radio 1 History - Transmitters". Radio Rewind. Retrieved 11 August 2013. ^ "[IT] Radio FM in Italia". Retrieved 22 September 2015. ^ "Change to the law to allow the use of low power FM transmitters for MP3 players". Ofcom. 23 November 2006. Retrieved 8 August 2015.